Mangos are a tropical fruit with a sweet and slightly tangy taste. Additionally, they are rich in fiber, as well as vitamins and minerals. Due to their nutritional value, they can be a good addition to a well-balanced diet -- particularly since they are a more beneficial means of satisfying your sweet tooth compared to candies or donuts. 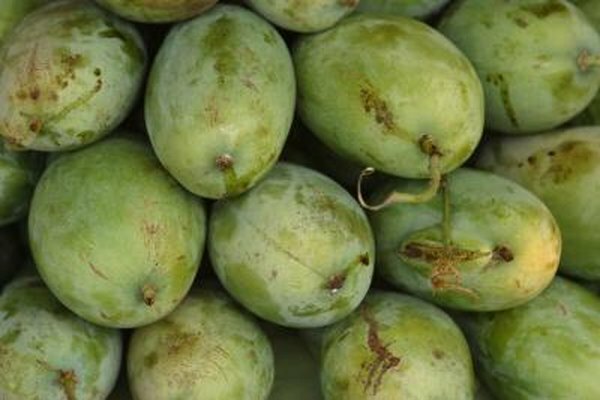 Mangos are a fruit grown around the world and used in a variety of cuisines, from Caribbean food to Thai cooking. When ripe, the most common varieties are red and yellow on the outside and bright yellow inside. They have a large pit in the center and you must peel the skin before eating. They are well worth the effort to prepare, as they are a uniquely flavorful fruit, besides being rich in healthy nutrients. Mangos should be just one good source of fiber in your diet, because fiber is important in any well-balanced nutrition plan. Fiber is a carbohydrate that your body cannot break down, so it keeps you full longer on fewer calories. Not only does fiber help you manage your weight, but it helps lower your cholesterol and maintain a healthy digestive tract. One mango contains around 5.4 grams of fiber and about 200 calories. This is about one-fifth of the recommended 25 grams of fiber women under the age of 50 need each day. It's about 25 percent of the 21 grams that women over the age of 50 need on a daily basis. In addition to fiber, mangos are rich in other nutrients. They are a good source of minerals like calcium, magnesium and phosphorus, and are high in potassium, with 564 milligrams in each fruit. That's 12 percent of the 4,700 milligrams of potassium that women need each day. Mangos are also high in antioxidants, particularly vitamins A, C, beta carotene and lutein. Mangos are also good sources of folate and choline. While mangos are high in fiber, they are also high in sugars, with almost 46 grams in each fruit. Instead of relying on mangos for all your fiber, you should also mix in other fiber sources. Healthy sources of fiber include other fruits and vegetables, grains and whole-grain product, nuts and legumes. While you may prefer fruits, you should also mix in vegetables, which are still high in fiber, but slightly lower in sugars.